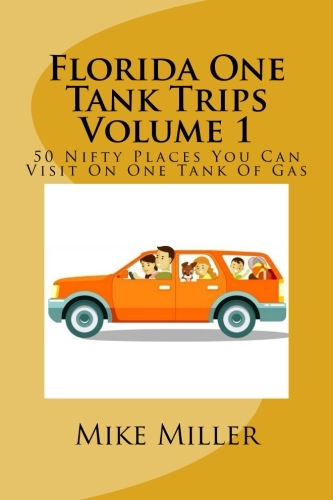 The Orlando Florida day trips and one tank trips described on Florida Backroads Travel are all within 100 miles of Orlando. Since Orlando is smack dab in the middle of Florida, there are many places you can go on the four corners of the compass. 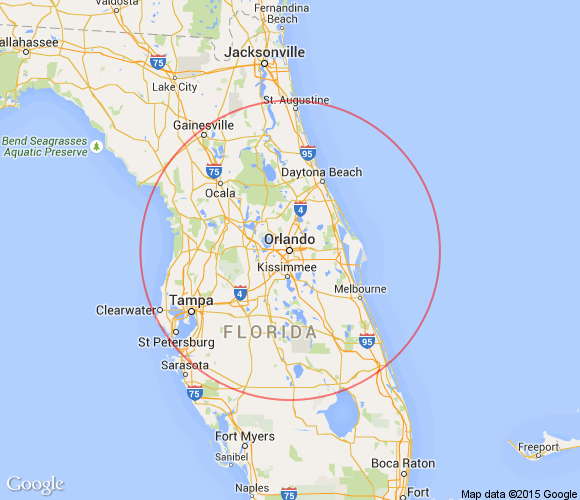 Places to see within 100 miles of Orlando, Florida. Here are some things to do and places to see within 100 miles of Orlando. The map below shows you some of the major cities within 100 miles of Orlando, and many of them are great destinations for Orlando Florida day trips. Air Force Space & Missile Museum is at Kennedy Space Center and includes many exhibits about the history of rocketry and space flight. Albin Polasek Museum and Sculpture Gardens in Winter is the home and studio of a prominent American sculptor. Included are several of his major works and a beautiful sculpture garden. Alexander Springs Recreational Area in the Ocala National Forest offers camping, swimming, canoeing, scuba diving, hiking, birding and wildlife viewing. Appleton Museum of Art in Ocala is a stunning example of classical architecture clad in Italian travertine marble. The museum features gallery space devoted to the Appleton’s permanent collections. Avon Park is a small town along the scenic drive through citrus country south of Lake Wales. Babson Park is also on the scenic drive through the citrus groves of central Florida, and is the home of Webber College. Bok Tower Gardens is a botanical and architectural treasure near Lake Wales. The beautiful tower houses a carillon that plays at regular intervals. Blue Spring State Park in Orange City is a great spot to see manatees sheltering from the cold in the clear waters from November to March. Boggy Creek Airboat Adventures in Kissimmee has 12 airboats for a wide variety of tours where you will see wildlife including water birds and alligators. Bok Tower Gardens in Lake Wales is a beautiful tower and gardens in a historic setting on one of the highest hills in Florida. 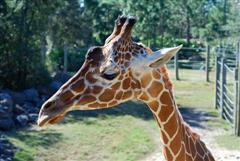 Brevard Zoo is an animal habitat built entirely by volunteers and has become one of the most popular central Florida attractions. Canaveral National Seashore near New Smyrna and Titusville has the best 24 miles of undeveloped beautiful beach anywhere in Florida. Cassadaga is a historic village of spiritualists, mediums, and healers, that is open to the public. Castillo de San Marcos in St Augustine is the oldest 17th century fort in North America. There are many exhibits and guided and self guided tours. Cat Boat Tours in Mount Dora lets you pilot your own twin hulled motor boat on Lake Dora while a captain in his own boat narrates and points out highlights. 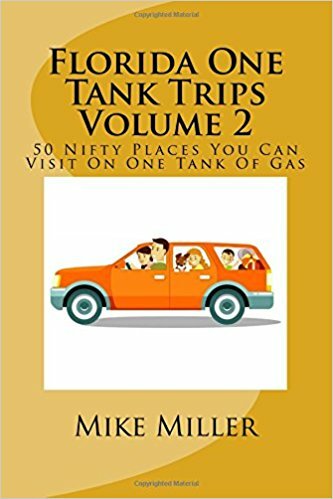 Central East Florida Day Trips is a page on this website that has maps showing interesting back road drives in the coastal area east of Orlando. Central Florida Day Trips is a page on this website that has maps showing interesting back road drives around Orlando from Ocala in the north to Lake Placid in the south. Central Florida Railroad Museum in Winter Garden is a small museum that focuses on the railroads of Central Florida. Central Florida Tourist Attractions that were here before Walt Disney World opened in 1971 and are still operating. Cherie Down Park has a beautiful beach in Cape Canaveral just north of Cocoa Beach. You can also visit Ron Jons, the Cocoa Beach Pier and other locat attractions. Cocoa is a Space Coast town worth visiting because of its beautiful downtown area, Cocoa Village, noted for its fine restaurants and shopping. 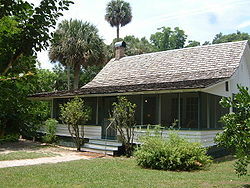 Cross Creek was the home for many years of Marjorie Kinnan Rawlings, author of "The Yearling" and "Cross Creek". Daytona Beach is a motor city and beach city. You can drive on the hard packed beaches and visit the NASCAR track in town. Daytona International Speedway lets you visit on non-event days and you can go on a first come-first served tour. Deland is the home of Stetson University and has a wonderful downtown area with restaurants and shops in restored historic buildings. Lots of trees and murals throughout the town. Devil's Millhopper Geological State Park in Gainesville is an unusual geological formation that has been attracting visitors for well over a century. Dinosaur World in Plant City is an attraction that features replicas of more than 150 dinosaurs. It's fun and educational. Disney Springs is a giant outdoor shopping, dining, and entertainment complex at Walt Disney World Resort with free admission. Doctor Phillips is a community south of Orlando along Sand Lake Road. It is loaded with many restaurants and shops, and is close to Universal Studios and the attractions along International Drive. Doctor Phillips Center for the Performing Arts includes the Walt Disney Theater, the Alexis & Jim Pugh Theater, the DeVos Family Room, the Seneff Arts Plaza, and many other spaces. Don Garlits Museum of Drag Racing in Ocala has more than 90 race cars on display and another 50 antique cars. Eustis is an old Florida town northwest of Orlando that has a neat little downtown area and parks along the southeastern shore of Lake Eustis. Epcot is one of 4 theme parks at WDW. This park celebrates human achievement in technology and culture. Evinston is a small community near Cross Creek and home to the old Wood & Swink General Store on the National Register of Historic Places. Fantasy of Flight in Polk City displays more than 140 civilian and military planes and many of them can fly. Farm Tours of Ocala is a 3 hour and 15 minute tour of working farms where you can go behind the scenes and chat with pros who work with thoroughbred horses. Flagler Beachfront Winery is in Flagler Beach, right on the ocean. Enjoy wine tasting with an ocean view. Flagler College (Ponce de Leon Hotel) was built in St. Augustine by railroad tycoon Henry Flagler in 1888 and is a National Historic Landmark. You can take a tour and explore the grandeur. Florida Air Museum in Lakeland is Florida’s “Official Aviation Museum and Education Center”. It is on the campus of the Sun ‘n Fun fly-in and expo at Lakeland Linder International Airport. Florida Citrus Tower is a 65 year old attraction in Clermont west of Orlando. An elevator to the top takes you to a wonderful view of all central Florida. Florida Museum of Natural History in Gainesville is the state's largest and is on the campus of the University of Florida. Fort Christmas Historical Park is a full-scale replica of the one that was built on Christmas Day, 1837, in the community of Christmas. Fort Gates Ferry is a historic ride across the St Johns River between the Ocala National Forest and Fruitland. Frank Lloyd Wright Child of the Sun. The largest single collection of the great architect's buildings are on the campus of Florida Southern College in Lakeland. Fun Spot America on International Drive in Orlando has 4 different go-kart tracks and 3 roller coasters, plus another 3 different thrill rides. Gainesville also has plenty to look at in addition to the university and the museums. The town has many historic neighborhoods and buildings, and a lot of nice restaurants. 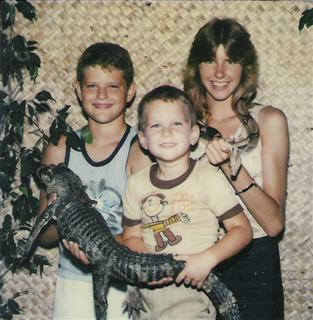 Gatorland north of Kissimmee was entertaining tourists and locals long before Walt Disney World came on the scene. Harbor Branch Ocean Discovery Center in Fort Pierce is a large functioning oceanographic research institution with a storied history. Highlands Hammock State Park near Sebring has one of Florida’s most diverse collections of plant and animal life. It is home to 1,000-year-old oaks, old growth hammock, and the Florida panther. Highland Park is a small golf course town in the rolling hills south of Lake Wales. It has one of the oldest golf courses in Florida. ICON Orlando, on International Drive in Orlando is giant 400 foot tall observation tower in the form of a Ferris Wheel with separate enclosed air conditioned observation capsules. Kennedy Space Center Visitors Complex takes all of a day to see and maybe two. See hundreds of exhibits and displays, the real Space Shuttles, theaters, bus tours, and much more. Lakeland is located among several lakes and has a lot of wonderful statuary to look at in downtown. Lake Placid is the Caladium Capital of the World and has transformed its typical little downtown areas with murals on the buildings. Lakeridge Winery is near Clermont. Watch wine being made, enjoy tasting and tours. Also lots of entertainment and music. Lake Wales is the center of the citrus industry and is close to Bok Tower Gardens, a treat you should not miss. Legoland Florida Resort in Winter Haven is a 150 acre theme park with more than 50 rides, dozens of shows, shops, restaurants, and a water park. Leu Gardens in Orlando has almost 50 acres of beautifully landscaped grounds, lakes and trails. Enjoy 200 year old oaks and acres of camelias. Marineland Florida south of St. Augustine is a dolphin research center that was once Florida's most popular tourist attraction. Marjorie Kinnan Rawlings Historic State Park in lets you experience what farm life was like when the famous author lived here. Her Florida Cracker style home and farm has been restored and is preserved. Maytown Road is a lightly traveled paved road through one of Florida's last large wilderness areas. McLarty Treasure Museum south of Sebastian Inlet features treasure artificats and displays from some of the 11 Spanish galleons sunk in the ocean near here over 300 years ago. Melbourne is on the Space Coast and Indian River Lagoon. Its downtown area is historic and renovated with lots of shops and restaurants. Melrose is a small Victorian village near Gainesville with historic buildings and a fine restaurant. Menello Museum of American Art in Orlando displays collection of paintings by Earl Cunningham, a folk artist who painted mostly coastal landscapes of America’s Atlantic Coast. McIntosh has a population of only 469 people but has almost 70 buildings in its designated historic district. Merritt Island National Wildlife Refuge is a huge refuge is in the shadow of Kennedy Space Center. It has 140,000 acres and over 1,000 species of plants, 117 fish species, and much more. 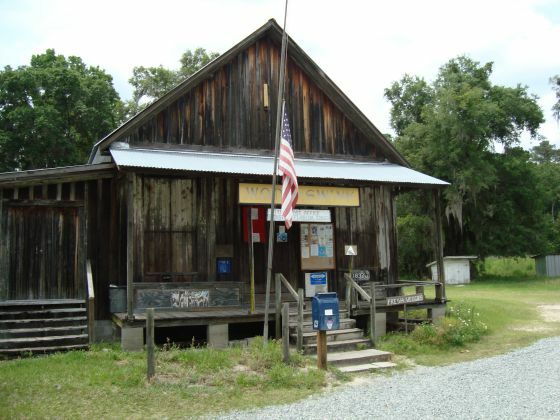 Micanopy is a historic tiny town named for a great Seminole chief. Nice antique stores and restaurants. Morse Museum in Winter Park is home to the world's most comprehensive collection of the works of Louis Comfort Tiffany, including jewelry, pottery, paintings, art glass and more. Mount Dora is a small town on Lake Dora in the hill country northwest of Orlando. It has become an antique and art center with plenty of shops and frequent festivals and other events. It is one of our favorite Orlando Florida day trips. National Navy UDT-SEAL Museum in Fort Pierce has artifacts and exhibits dedicated to SEAL warriors and their predecessors, the Underwater Demolition Teams (UDT). New Smyrna Beach is where Orlando natives like to visit the beach. 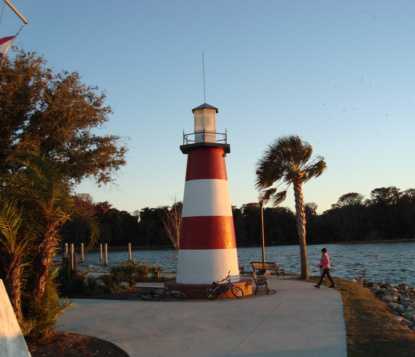 It is a charming small town along the Atlantic Ocean and Intracoastal Waterway. Ocala is the center of the thoroughbred horse industry in Florida. A lot of great horse statues are scattered throughout downtown and the whole city is surrounded by beautiful rolling horse farms. Ocala National Forest has 607 square miles with 600 lakes, campgrounds, hiking and off road trails, and many animals including black bears, deer, boar, otters, and more. Old Florida Carpenter Gothic Churches. See 5 of these rare historic churches in the Orlando area. Oldest House Museum Complex is located across from the historic National Guard building in downtown St. Augustine. Orlando is loaded with more tourist attractions than one can possibly visit. It also has many beautiful neighborhoods and a revitalized downtown business district. 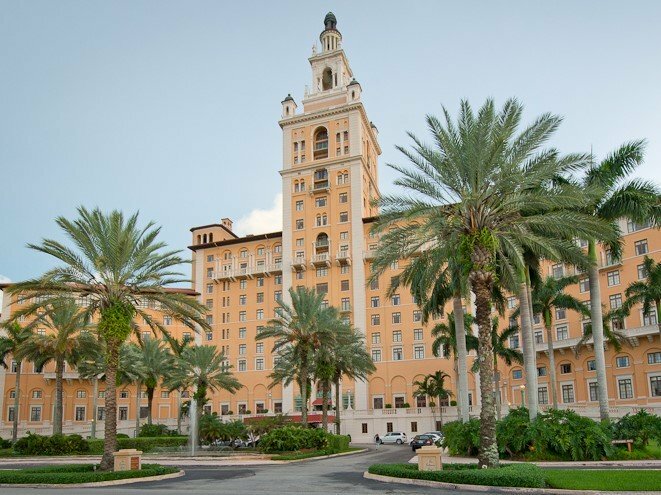 Get away from the bustle of Universal Studios and Walt Disney World and visit a real Florida city. Since the city is in the center of the state, it is the logical place to enjoy your Orlando Florida day trips. Orlando Science Center teaches science and makes sure kids have fun doing it. It features 4 floors of science exhibits, giant screen movie theaters, and live programming, exhibit halls and science stations. 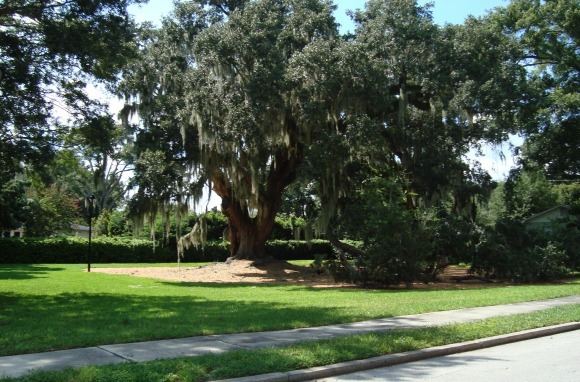 Orlando Significant Tree Tour is a self-guided tour of several significant trees in the City of Orlando, some hundreds of years old. Orange County Regional History Center in Orlando has a lot of exhibits about the Orlando area that will entertain adults and kids alike. Ormond Beach is the birthplace of automobile racing. You can visit The Casements, famous home of John D. Rockefeller. Paisley is a small town north of Orlando where an old cemetery is the resting place of Walt Disney's grandparents. Ponce Inlet Lighthouse is south of Daytona and offers you a climb to the top for a magnificent view. Princess Place Preserve is north of Palm Coast and is a nature conservation area that was once the home of a pioneer princess. Ripley's Believe It Or Not! Museum in St Augustine has bizarre displays including more than 20,000 photographs, 3,000 artifacts, and more than 100 panels from Ripley's cartoons. Schooner Freedom in St. Augustine is a 76 foot schooner where you can go for a sail and even help sail it. You will see the sights of the Ancient City. Sea Turtles on Florida Beaches is and amazing event you can see during nesting season from May to October. The turtles nest on beaches in every region of the state. SeaWorld Orlando is home to dolphins, whales, sharks and a lot of entertained tourists. One of the original big three Orlando attractions. Silver Springs State Park in Ocala is home to a former private attraction where you can enjoy riding on the glass-bottomed boats and being amazed at the crystal-clear blue waters of Silver Springs. Spook Hill in Lake Wales is an attraction that has been around for years. Park your car in neutral and watch it apparently coast uphill. St. Augustine is one of Florida's favorite tourist attractions. Visit some of the oldest neighborhoods and buildings in the United States. St. Augustine Alligator Farm is the oldest in Florida, and has a huge selection of animals including gators and a 14 foot long crocodile. St. Johns Rivership Company in Sanford is where the 105 foot modern sternwheeler "Barbara Lee" takes you on a narrated cruise on the St Johns River. The Lightner Museum in St. Augustine is a former grand hotel with a large collection of fine and decorative 19th century art, much of it from the gilded age. The Villages is a planned community northwest of Orlando that is developed around numerous golf courses. Lots of good dining and shopping. Universal Orlando Resort is near SeaWorld and has a lot of shows and activities based on Universal movies. Islands of Adventure is loaded with thrill rides. Valiant Air Command Warbird Museum in Titusville focuses on war planes from the earliest days of aviation to the present day. Their collection includes more than 45 historic warbirds. Vero Beach has some of the nicest beaches in Florida. Disney also has a beach resort just north of Vero in Wabasso. Walt Disney World Resort is the most visited theme park in the world. You can spend your entire vacation here, but you will pay dearly for it. Webster flea markets are open only on Monday. 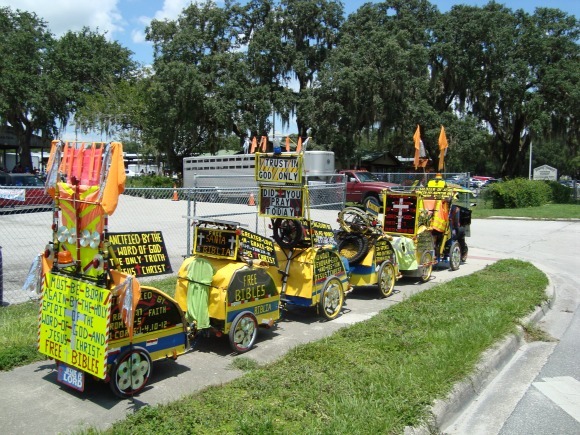 The biggest flea market in Florida. Wekiwa Springs State Park in Apopka has been a popular recreational spot for Orlando area residents and tourists for more than 100 years. Windermere, a small town near Walt Disney World with canopied streets and Old Florida ambience. 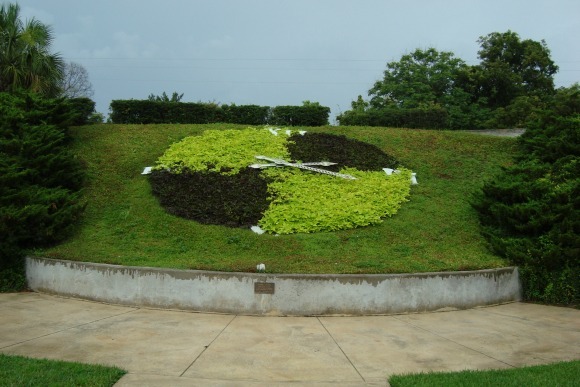 Winter Garden, a small town west of Orlando with a revitalized downtown business district. Winter Haven, a pretty town among the lakes south of Orlando. The home of Legoland on the grounds of the former Cypress Gardens. Winter Park , a small upscale enclave in the Orlando metro area on the north side. Great shopping, dining and art festivals. Morse Museum with a lot of Tiffany objects, and Rollins College. A great place to stay while you enjoy your Orlando Florida day trips. Winter Park Scenic Boat Tour takes you to several lakes connected by scenic canals. The pontoon boat guides know their stuff and show you a lot of historical places and natural things on your one hour cruise.